Guitarist Jeff Ray resides in Harlem, New York, in the historic Strivers Row neighborhood. A native of Toledo, Ohio, Ray moved to New York in 1998, after completing his master’s in music at Rutgers University, where he studied with Kenny Barron and Ted Dunbar. Ray earned his bachelor’s degree in music from the Ohio State University after a stint at Miami University (Ohio) during which he played both football and baseball. Having taken up guitar at the age of 14, Ray was blown away upon discovering recordings by Dexter Gordon, Kenny Burrell, Wayne Shorter and Grant Green, among others. This exposure proved to be pivotal, driving him in the direction of jazz and improvised music. Landing in Harlem after a brief layover in Brooklyn, Ray immersed himself immediately in the vibrant and diverse uptown music scene, playing his hollow-bodied Heritage guitar in straight-ahead acoustic bands and organ trios, and his electric instrument in accompaniment of R&B vocalists and while fronting instrumental funk and R&B bands. He has played more than 200 gigs in Harlem alone, at venues such as St. Nick’s Pub, Jimmy’s Uptown, Perk’s, Robin’s Nest, Sugar Bar, the Gishen Café, Canaan Baptist Church, the venerable, now-defunct 22 West, and Copeland’s. Beyond Harlem, Ray has performed at numerous East Coast and Midwest venues of note, including 55 Bar, the Supper Club, Cleopatra’s Needle, Nell’s, Joe’s Pub, Zinc Bar, and Soul Café in New York City, Blues Alley and Twins Jazz in Washington, DC, Ortlieb’s Jazzhaus in Philadelphia, Manhattan’s and Rusty’s Jazz Café in Toledo, and Night Town in Cleveland. Ray maintains a longstanding affiliation with The Onus, a straight-ahead quintet he fronts along with Baltimore-based clarinetist/bandleader Darryl Harper, who is a fellow Rutgers alumnus. He has recorded two CDs with The Onus, whose members boast affiliations with such jazz luminaries as Lou Donaldson, the late Al Grey, Stefon Harris, Orrin Evans, and the late Shirley Scott. Ray’s distinctive compositional voice was first captured on The Onus’s second CD, Reoccurring Dream (2000), to which he contributed two noteworthy compositions, including the title track. The guitarist has also performed regularly in New York with R&B vocalist Devora and appears on her 2000 release, On Tour featuring Devora. Other ongoing affiliations include drummer Dennis Davis (Stevie Wonder, Roy Ayers), and vocalist Marie Daulne of Zap Mama, with whom Ray has recorded informally and plans to tour in 2003. In both the jazz and funk/R&B contexts, Ray thrives on connecting with live audiences through his melodic interpretations, expressive improvisation, and propulsive rhythmic accompaniment. Lately, his guitar work has attracted the ear of producers such as Rob Murat and Yogi (member of P. Diddy’s production team), for whom he has recorded tracks for upcoming albums by artists including Mary J. Blige. In the summer of 2002, Ray recorded The Walkup, his debut CD as a leader. Released in October 2003, the CD features Ray on electric guitar with Aaron Swinn on Fender Rhodes keyboard and B3 organ, 1995 Monk Competition winner Darryl Hall on electric bass, and Victor Wise (Lonnie Smith, Gap Band, Chuck Brown) on drums. 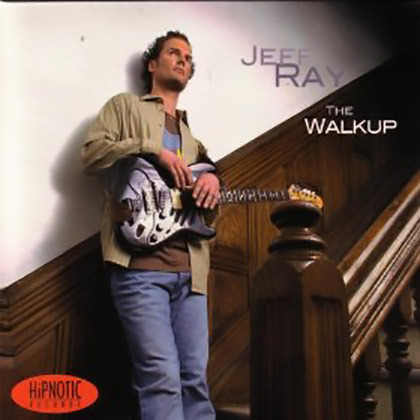 The Walkup is a culmination of the diverse musical influences that have shaped Ray’s ever-evolving musical concept to date. Accordingly, the CD is long on improvisation, sophisticated ensemble interplay, and danceable grooves, putting it in the general vein of the pioneering jazz-funk fusion work of Roy Ayers and Herbie Hancock and recent offerings by jam band/groove gurus such as John Scofield. Ray’s knack for creating ear-catching melodies and captivating grooves is displayed on six original compositions. Ray also puts his personal stamp on renditions of Ayers’s classic “Everybody Loves the Sunshine” and the club single “Hot Music,” the latter featuring an extended James Brown-flavored interlude. Ray’s experience playing for uptown New York audiences has brought the fulfillment that comes from enthusiastic acceptance by demanding and appreciative listeners who don’t draw a distinction between “jazz” and “dance music.” Ray discerns a commonality between these audiences and the legions of jam band fans who flock to concerts by the likes of Scofield and Soulive — both to move and to be moved. With Harlem as his base of operations and The Walkup as his vehicle, Ray is on a mission to move audiences far and wide!